I recall Anima being one of the characters introduced during the Bloodlines Annuals event in 1993, and of course remember the character more than others as she (obviously) had her own series or a short time. That said, this is the first I can consciously remember actually reading of the character. Reading this issue, though “only” 7 into its run, was not a fun thing out-of-context. I could recognize the main character and associates by context-clues and figure stuff out, but the story seemed (in part for my lack of familiarity with any of the characters or the full context of the continuity/situation at this point) to jump all over the place enough that I’m not even gonna try to summarize it. Suffice it to say that this felt like diving into a mid-season episode of some tv show and maybe not being disgusted or put off enough by it to turn it off, but it definitely was not the most engaging nor (detail-wise) memorable. Essentially, there’s this girl, known as Anima, with a bond to some sort of demon named Animus. Animus is imprisoned by siblings/colleagues, as others conspire to do something nasty to the realm of Man, and Anima/Animus are key to stopping that, hence an adversarial situation. Outside of Eliopoulos on lettering, I really don’t recognize the creative team. Then, the fact that outside of probably this issue (seeing it in the Zero Hour stack and as an issue coming up in the queue) I haven’t really even considered the series for years adds to this series’ isolation in history and continuity. This character came out of the DC Universe Bloodlines stuff; carries the standard DC logo, carries in this case the Zero Hour and DC Universe banner, so it was (at the time at least) certainly in-continuity and such (mid-1990s!). But you would hardly know it to look at any contemporary DC lineup, probably not SINCE the actual 1990s (1999/2000 or so). That lack of recognition, memory, impact, lends to the weirdness of reading this…certainly refreshing in its way as one of those titles that I seriously doubt would even get a publishing chance nowadays, let alone an audience to go seven issues (let alone any further). The parts with Animus and siblings struck me as rather Hellblazer-esque (ok, perhaps this’d fit in with the new Hellblazer title in Rebirth?) and thus in continuity but tucked off into their own little separated section of continuity. There’s an offhanded reference indicating Anima had gotten Superman’s message (from waaaaaayyyyy back at the start of Zero Hour!) but outside of that and the fade-to-white abruptness ending this issue, you wouldn’t know it had anything to do with a bigger crossover. This certainly fits the “red skies” designation of sorts…that is, there’s a passing shoe-horned-in reference for a panel or two, but otherwise the issue’s actual story is not impacted nor does it in turn impact, the main event story it supposedly ties in with. 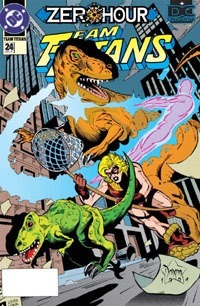 I think this issue would probably fit pretty solidly in with its own series as a run–reading Anima from first issue to however long the series ran–but it’s not even really “fun” as an isolated, standalone issue; it does not advance Zero Hour itself, nor does it shed any real light on something that the main Zero Hour just didn’t have space to do. I would not recommend this outside of an Anima read-through; and given (if only) my own conscious lack of memory of anything impactful even from this series long-term, I certainly would not recommend paying more than 25-50 cents for this in a bargain-bin purchase.